This is in part a story of procrastination! 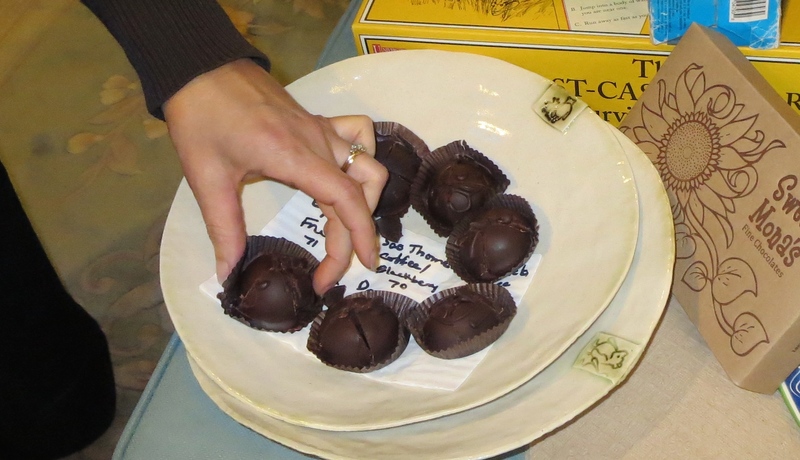 I borrowed a bowl last December, early in the borrowing season, and yet here it is September 3rd, with the auction almost upon us, and I am only now posting photos and the story of our bowl’s visit. This is also, more importantly, a story of place and home and gathering. I moved to Whidbey full time almost two years ago. As Wendell Berry put it, I am here to \”make common cause with place\”. Growing up around the world (10 countries on 5 continents by the time I was 18), and with a career that oriented me globally, I have now chosen to experience what it is to put down roots – to put down roots with the anticipation that there is time to put them down deeply into this particular geography and this particular community. Last December, then, family gathered on Whidbey to celebrate the holidays. 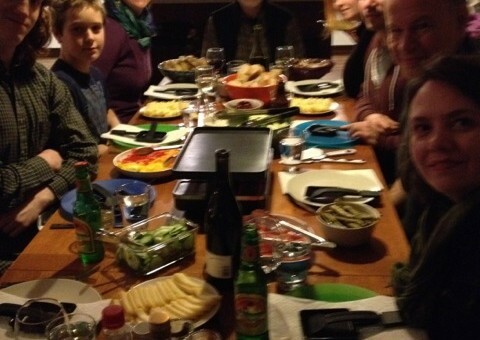 We prepared raclette, a traditional Swiss meal of potatoes, melted cheese, and pickles (we supplement the tradition by also broiling vegetables). 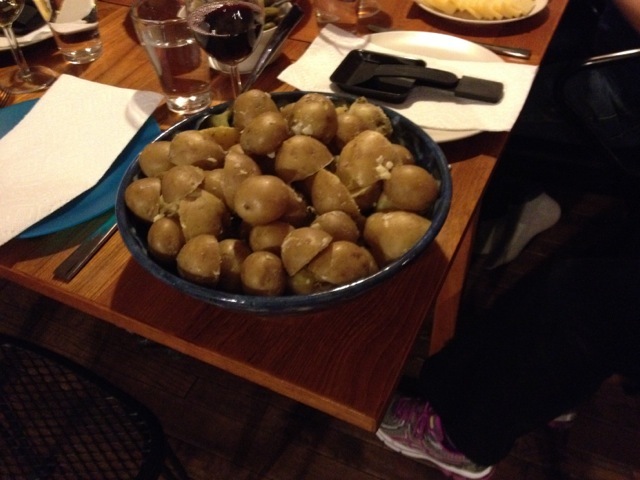 We used our borrowed Good Cheer bowl to hold the potatoes, passed from one end of the table to the other, from person to person, lots of love and laughter also being passed. The beautiful thing about having procrastinated in this posting is that I now have a way to benchmark my Whidbey rootedness. Then, I had barely broken ground on my cottage; now I am moved in and feeling settled. 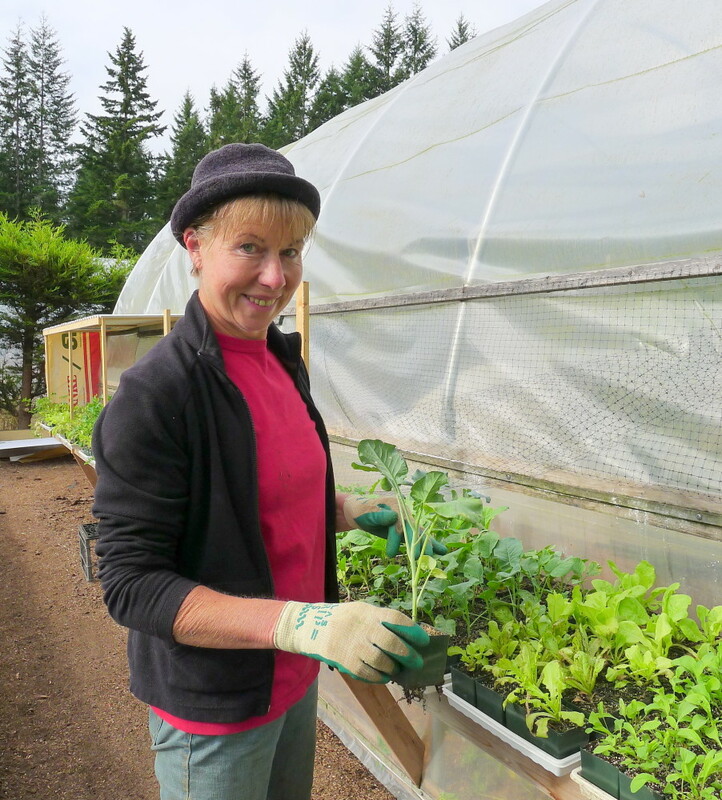 Then, I had only recently joined the Board of the Whidbey Institute; now I feel an integral part of helping to advance the strategy of our work. Then, I had had only a single season with my new vegetable garden; now I have cycled into it more deeply and am preserving the harvest: I just did my first hot bath canning of dilly carrots and pickled garlic! Then, I would go to the Muk for coffee and sit quietly with my book; now I often put my book aside to catch up with friends who unexpectedly appear. My life is full and blessed and I wish the same for all those who in the future use this Good Cheer bowl. In March, a small group of four gathered to eat, drink, and be merry. 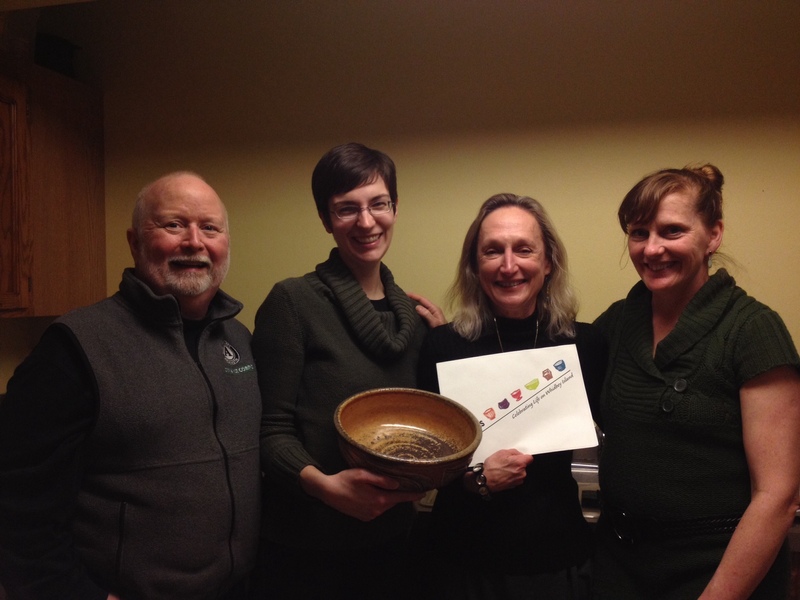 The Bowl, from Coupeville’s Bayleaf, held an aromatic seafood curry. The meal filled our bellies and the fellowship filled our souls. Borrow a bowl! Why yes, I’d be happy to because I had something to celebrate. I was going to keep my house. Well, really I was going to be in a trial period that may result in a mortgage modification that may have a probationary period, but those are details. This was something to celebrate, particularly with the community of friends who’ve helped me through. But what to put in the bowl? So many of the other stories have impressive recipes. I love to cook, but those recipes set a high bar. 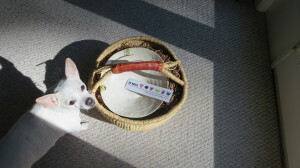 Then I looked at what came with the bowl. 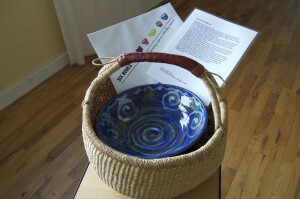 Patricia Duff wrote the meaningful backstory to the bowl. (Every bowl gets some bit of literary eloquence.) She called it an Everyman bowl. 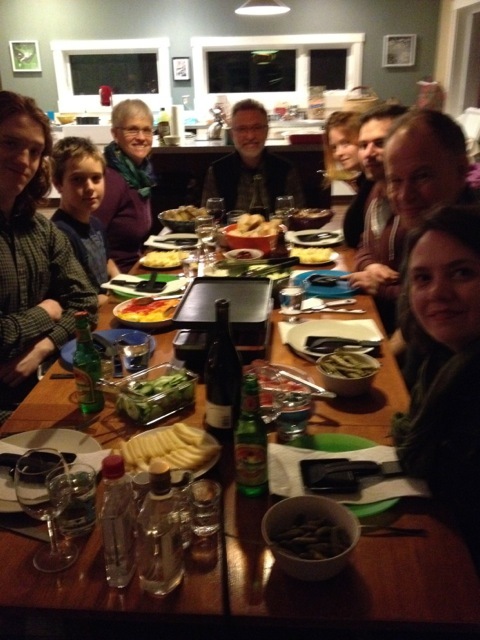 Cooking for every one is difficult because we are a diverse crowd by choice and necessity. So, I decided to put enough different things in the bowl to please, almost, everyone. 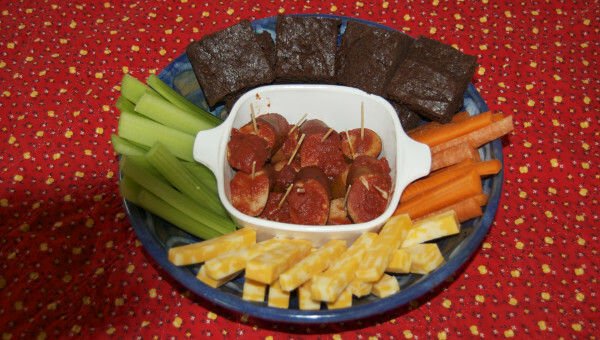 Sausage in the middle, flanked by carrots and celery, fronted with cheese, and backed with brownies. 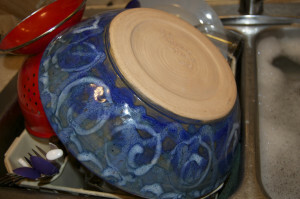 Bundle the bowl back into its basket. Hang onto the memories of the party and my friends and what they’ve helped achieve. Nothing is certain so it makes sense to celebrate what we can, how we can, and include as many as we can. And maybe next time there will be more dancing. 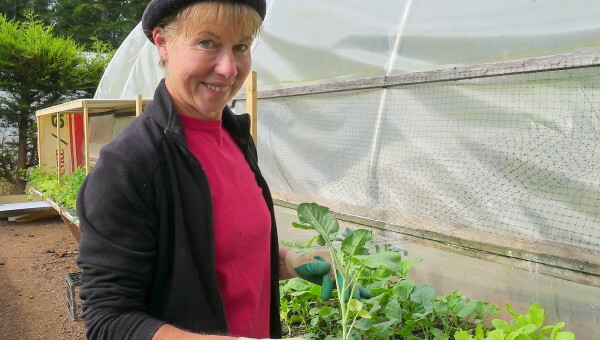 March 10 was the first day of the 2014 Organic Farm Training School year. 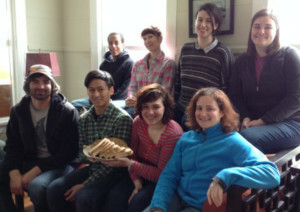 Faith Wilder hosted a Six Bowls lunch to bless the students. 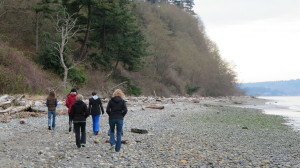 This was an opportunity to introduce them to the convergence of earth, art and spirit which Whidbey manifests. The 2014 Organic Farm Training students from New York, New Jersey, Georgia, California and Washington states with Inge Roberts’ nested Winnie and Friend bowl and Living Green totally Whidbey whole wheat bread…….. Judith Adams’ Pooh poem spoke of friends and cycles adding richly to the prayer offered for the nurture of the students and of the land. A simple lunch of Whidbey sourced foods included vegetable soup, bread with goat cheese and fresh butter with desert of apple/berry crisp. 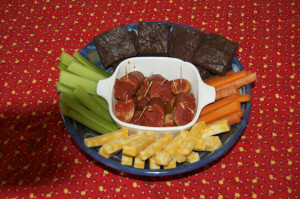 Being a March luncheon it was necessarily a combination of the fresh, the processed and the frozen. Some of the contributors were the Todd Peterson’s root cellar, Sue Ellen White’s gardeners’ kitchen, Little Brown Farm goats and Living Green ovens. Taking this moment in the sparseness of March to celebrate Whidbey and honor the students was sweet as were the admonishments of the students to return with another bowl at summer solstice to celebrate the bounty the students will bring from the earth. A new season of promise…….. 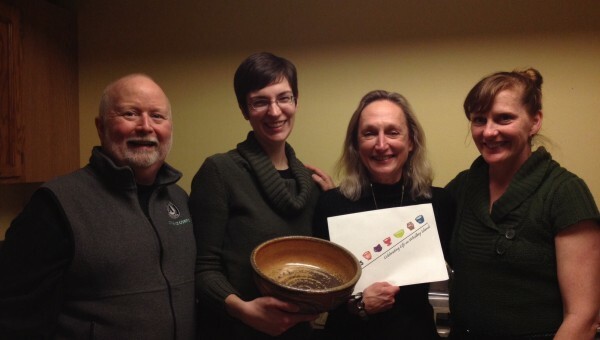 I was so excited to be a part of the Six Bowl Project.I went to Casey Crafts and picked up the bowl on Wednesday, February 5. The way the bowl was tucked into the beautiful basket with a leather handle, the way the bowl was nestled in between the brown colored shredded, crinkled paper…the bowl was so protected and safe and I was filled with warmth and joy just carrying it to the car.When I got it home, I had originally hoped to have a small get together with my friends and share the bowl with them, because my friends protect me and keep me safe, just like this bowl holds and protects its contents…but I wasn’t able to pull that off. I also wanted to share it with my family. 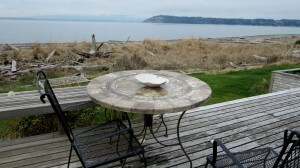 We have lots of birthdays in February (5), but only 3 of us who have February birthdays live here on Whidbey. I decided I would use the bowl to prepare part of the shared birthday dinner and also serve from it…once again I wasn’t able to pull that off. But what did happen was magical. I have spent a lot of time thinking about the bowl or the vessel that was coming my way. I had such great hopes to do wonderful things with it while it was in my possession…but what did happen was one beautiful afternoon. An afternoon shared among my closest friends…my mom and sisters and my neighbor! Earlier in the day I had written “The Vessel”…so I shared that with my family and friends and thanked them for being my bowl, my vessel in life…my protection, my safety net, the people who held and embraced me. 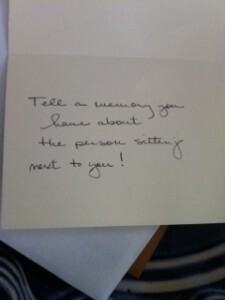 Then we served our birthday “brookies” (brownies and cookies made together), we each shared a memory of the person sitting next to them. 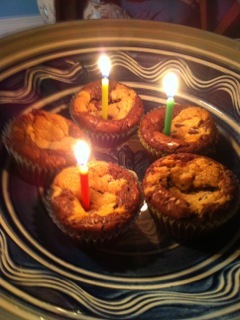 It was a wonderful birthday celebration! 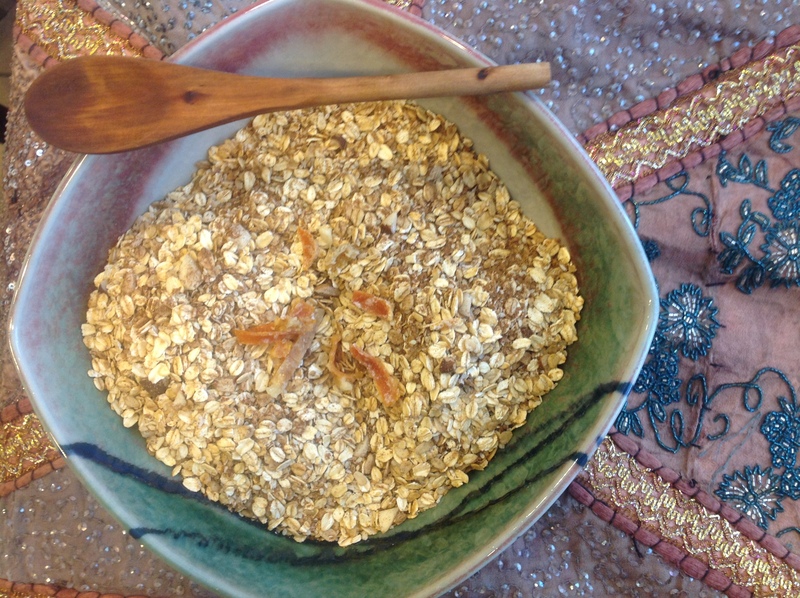 The bowl was then cleaned, dried and placed back in the beautiful basket with the leather handle, tucked back in between the brown shredded crinkled paper and return to Casey’s for the next person or family to embrace! The Vessel Vessel: noun \ˈve-səl\1. a container (as a cask, bottle, kettle, cup, or bowl) for holding something2. a person into whom some quality (as grace) is infused <a child of light, a true vessel of the LordA vessel or bowl, a common serving piece in one’s kitchen or household, used on a daily basis for breakfast, for preparing meals, for mixing, for serving.A vessel or bowl, an extraordinary piece of art, made by gifted hands, shared with love, shared with a community.A vessel or bowl of the Six Bowl Project, part of our family’s birthday celebration, touched by my Mom, and three sisters, holding the wishes for a wonderful new year. 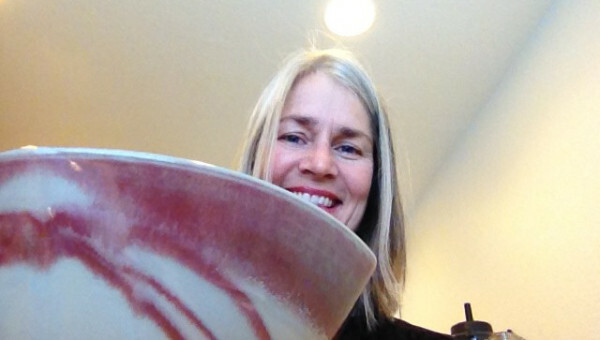 A vessel or bowl, ordinary and yet extraordinary…holding us together, providing shelter, nourishment, and safety, embracing each of us in love…holding us in love during times of wonderful celebrations and pain. 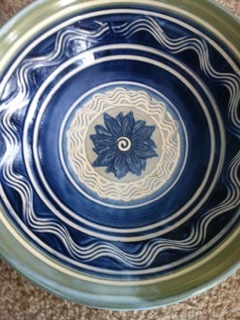 I am blessed to live in a vessel or bowl called my family. A place where I am loved and treasured. A group of women that offer me peace and safety, and steadfast unconditional love. Mother and sisters that encourage me, protect me, help me to love and grow!I have also been blessed to live within a community that is also a vessel or bowl of love, activism, taking care of each other, and embracing…Whidbey Island.Throughout my life…I have always lived within a family (whether it be my own family, my faith family, my work family, my family of friends, or the community in which I live, that have embraced, enfolded, surrounded, protected, given me love, supported and accepted me!! A vessel or bowl of people who have made me a better person, been there when I am scared and alone! 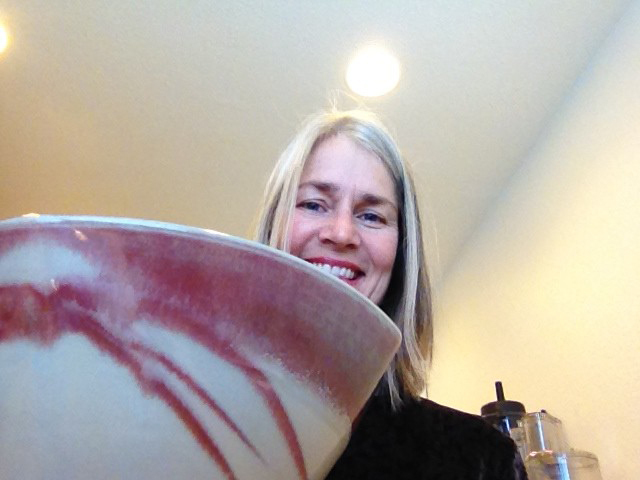 A vessel or bowl of people who have cheered me on, celebrated my successes and picked me up when I have fallen.So, here’s to the vessel, the bowl that surrounds each of us in love! I am truly blessed!Peace! Since there are just 2 of us, my husband and I have very informal meals. No need for a big beautiful bowl most of the time. So I reserved the bowl, which has now been used by many in this great circulation event, to take my potluck dish to a friend’s birthday party. There were 16 women present – who all appreciated the history of the bowl and some who will now sign up to take their turn. 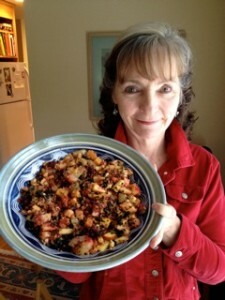 What I shared was a curried quinoa salad with roasted root vegetables, apples, and walnuts. The bowl and the salad complimented each other beautifully. Most of all, getting to use the bowl and share it makes me feel even more connected in this amazing community. Turns out we are all related, sometimes it’s just not so obvious. Thanks for the inspiration of this idea!